Windows 10 has a lot going for it, but you might not like every change it has to offer. If you’re pining for the old analog-style clock that popped up from the notification area in Windows 7 and Windows 8, then a quick bit of registry editing can let you relive the old days. If you’ve never dabbled in registry editing before, it’s the hidden settings file that controls Windows and a lot of the applications that run on it—make a wrong move in the registry and you can cause some serious damage to your system, so proceed at your own risk. That said, a lot of registry tweaks are simple and easy to roll back, including this one, so you really shouldn’t run into trouble. You can launch Windows’ own registry editor by typing regedit into the search field on the taskbar, and then clicking the top result. Don’t worry if the registry looks confusing at first glance. Navigate to HKEY_LOCAL_MACHINE\ Software\ Microsoft\ Windows\ CurrentVersion\ ImmersiveShell, then right-click inside the right-hand pane and choose New and DWORD (32-bit) Value. Call the new value you’ve just created UseWin32TrayClockExperience, then double-click on it and set the value to 1. Click on the time and date in the notification area (also known as the system tray) and the old clock is back. 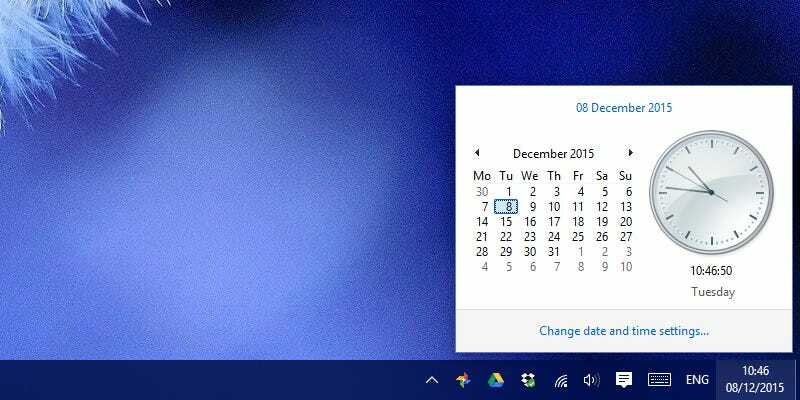 You might prefer this more compact, classic Windows look to the new calendar and clock offered up by Windows 10. If you want to bring the default design back, simply change the relevant registry key to 0 or delete it completely (right-click and choose Delete).